When my second-favorite century oak fell at Hawk Hill this spring I was devastated. I’m not exaggerating to say that I grieved it as I would the loss of a pet- that tree was special and so characteristic of Hawk Hill. While I am slowly adjusting to sunshine in a space that was always gently shaded, I am making the best of my new landscape- tucking tomato plants into a newly sunny spot, using fallen limbs to start a mushroom patch, and using a few logs to create some very special gifts and keepsakes in the form of handmade wooden spoons. While I will confess to an educated history in woodcarving, I don’t think it’s necessary for this project. 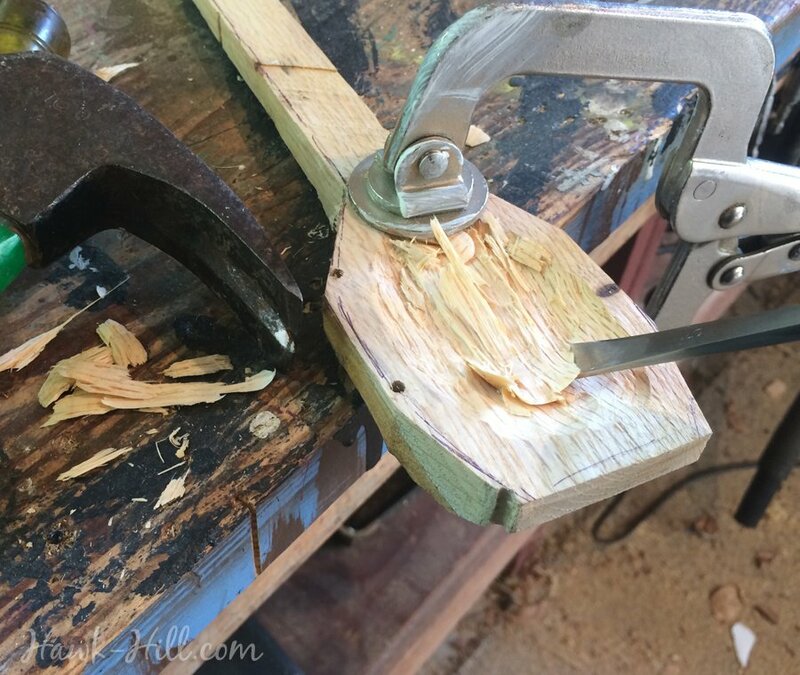 A basic assortment of tools, lots of sandpaper, and the kind of common sense required to preserve your fingers from accidental amputation are really all that’s required for a basic project like this. Would you believe my Junior High, in the mid-90’s, offered wood-carving classes? Far from today’s zero-tolerance policies that ban anything that could even look like a weapon, even basic art classes for 7th and 8th graders at my Junior High included courses on woodcarving- complete with regularly sharpened knives and gouges- thanks to a particularly Mountain-Man-esque male art teacher. 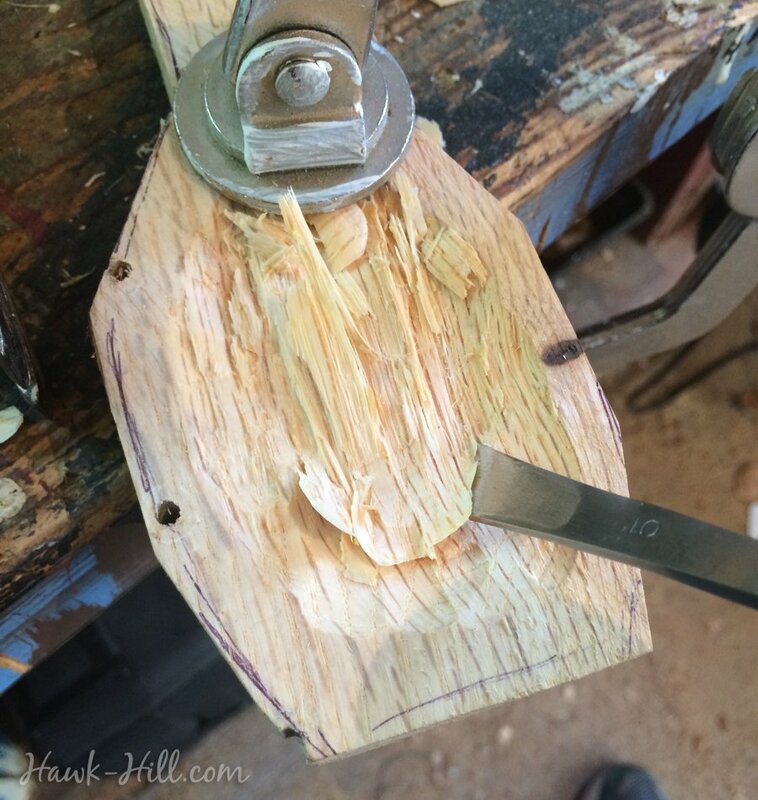 I really appreciate that chapter in my art education, as learning my way around wood and knives opened up a different media to me. 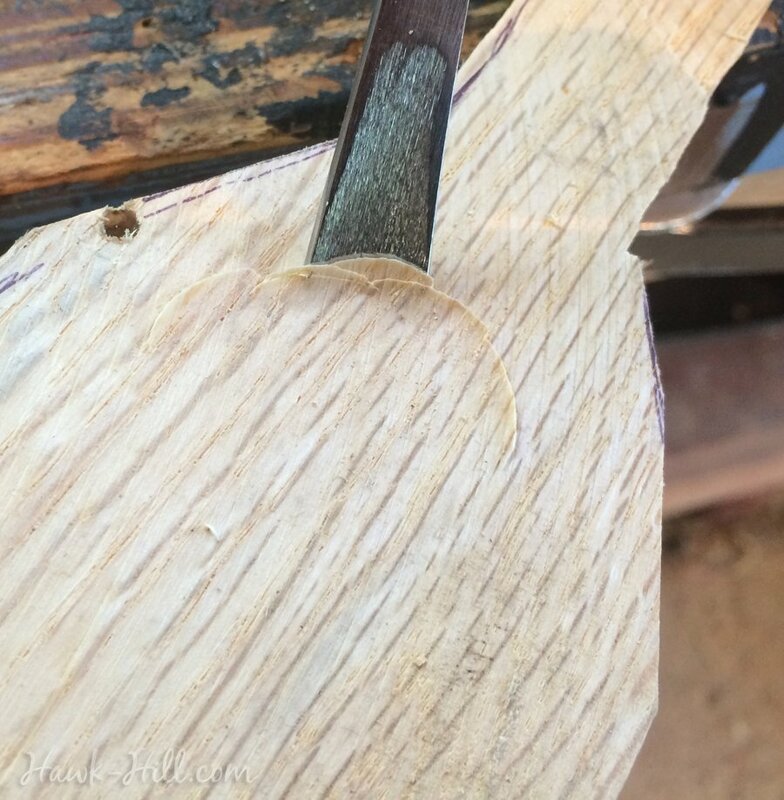 To make my spoons, I first selected a few healthy, thick logs, and sliced them lengthwise into 1-2″ thick slabs, with the grain running down the slab lengthwise. 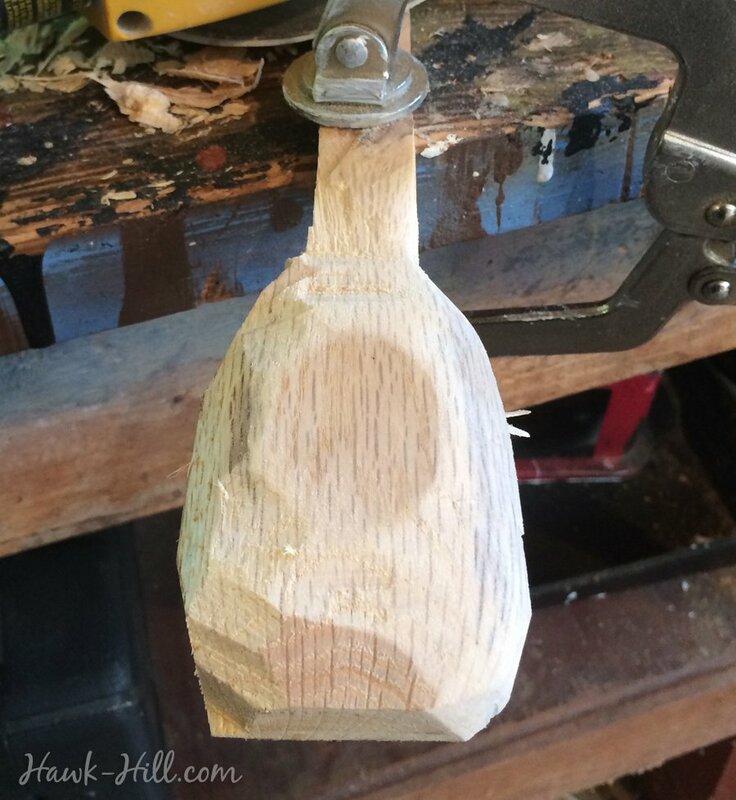 Normally, I’d want to try and avoid knots and imperfections in the wood and contour my spoon’s bowl and handle to accommodate the movement of the grain, however since I was working with a very hard wood, oak, accommodating the grain was less important. 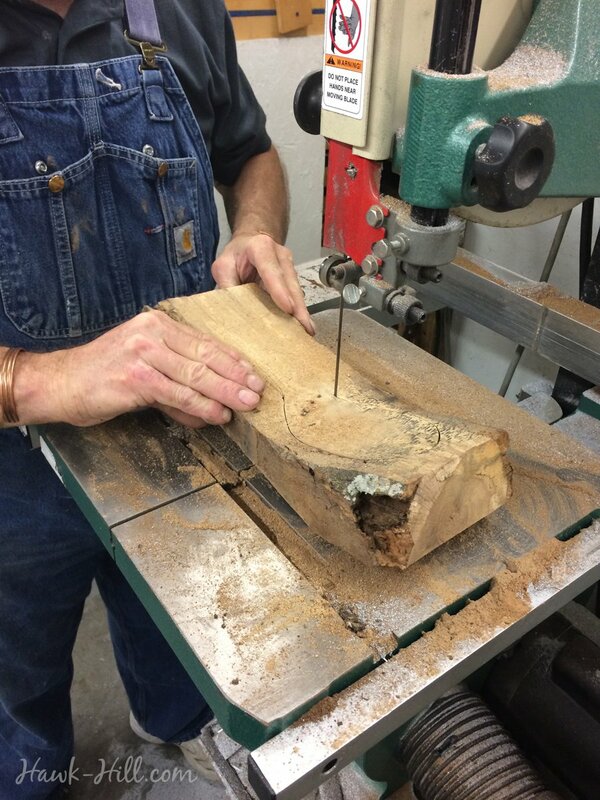 I did start working on my logs right away, though, knowing that as my wood dried it would become increasingly hard to carve. Fresh, wet wood is slightly softer. 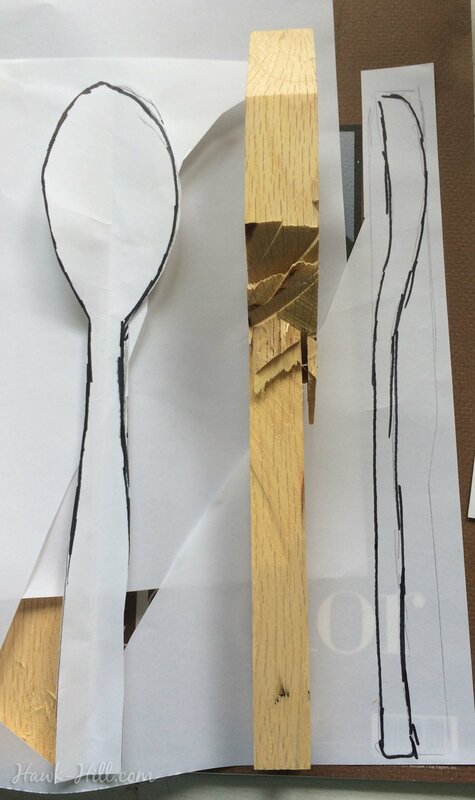 After I had slabs of wood I made a rough sketch of a spoon and cut that design out with a bandsaw. Ok. Confession. I don’t have a bandsaw. 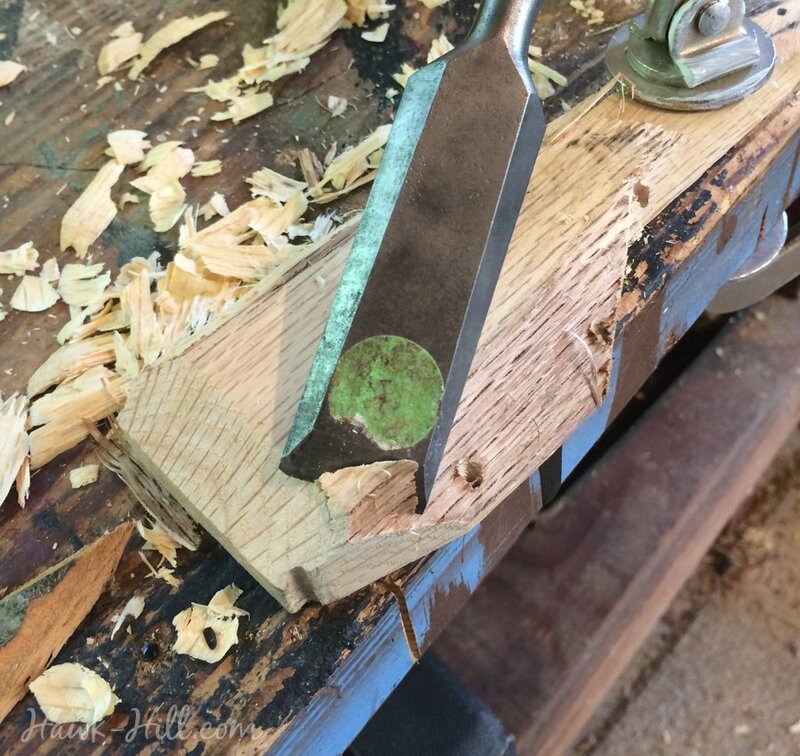 I wish I had a bandsaw- but I don’t. My dad does! So I convinced him to cut my oak logs with his not-meant-for-wood bandsaw and we managed to almost complete the project and only ruined two blades in the process! Once I had my rough cut spoons I put them in the freezer. Not because that’s vital step, but because it’s exceptionally hot outside and I don’t do woodworking in the house! The freezer kept my wood from drying while I waited for the weather to cool enough to make outdoor projects a reasonable pursuit. 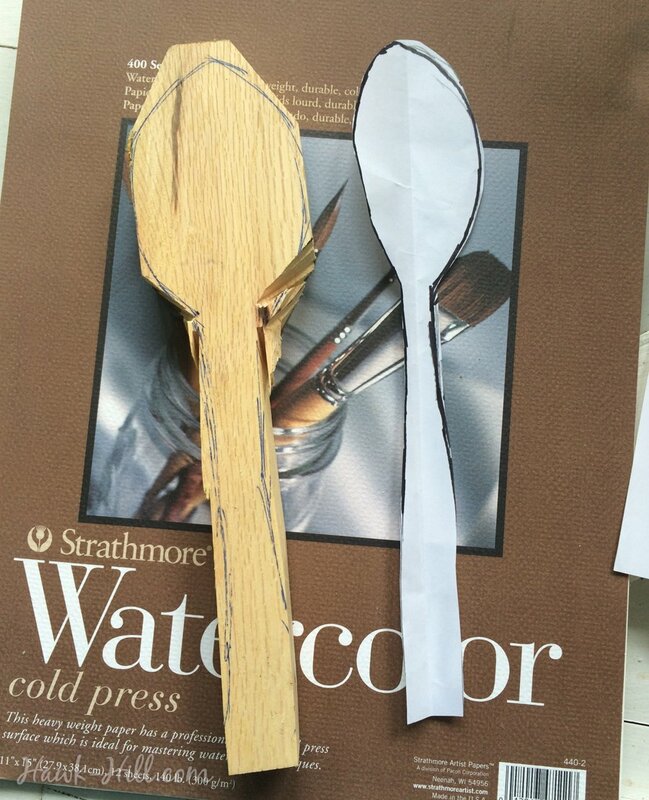 When I started back to work, I designed my actual spoons. 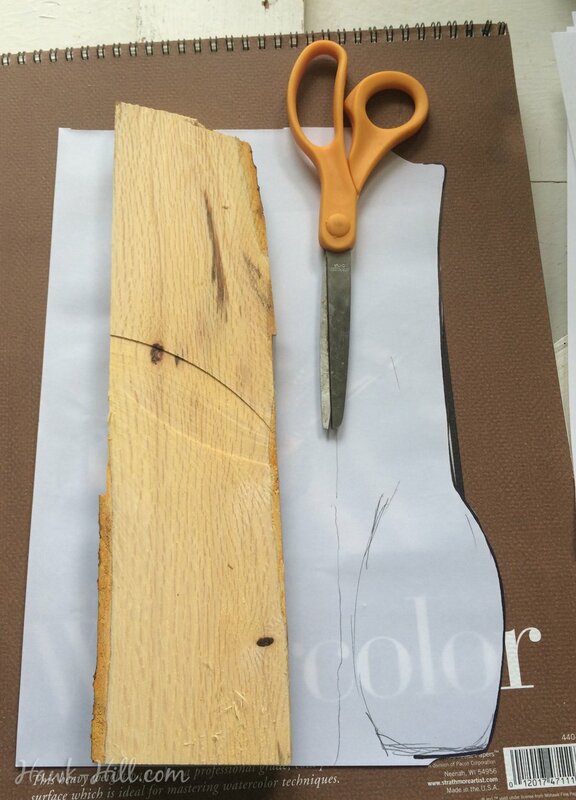 Using paper and scissors, then transferring the design onto the wood. And gradually a spoon emerged! 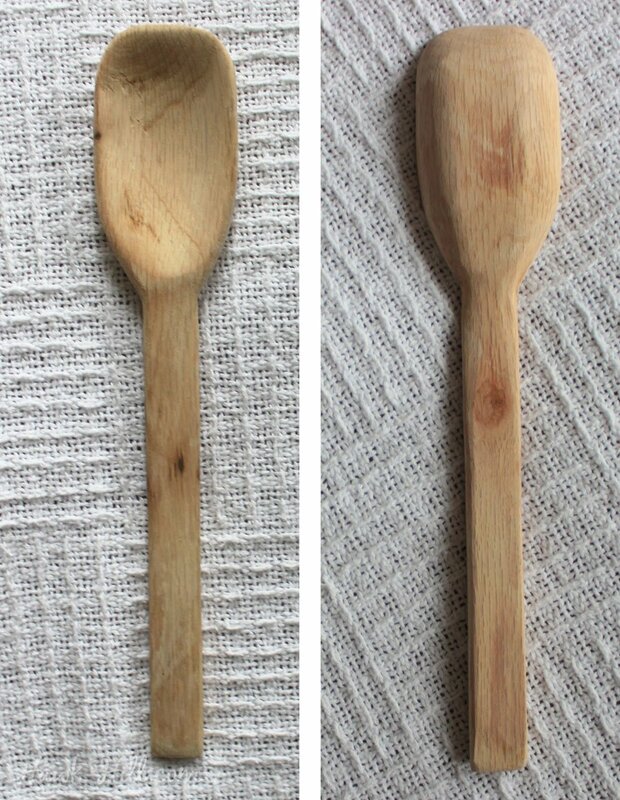 The final result of my first attempt at would carving is not, it would be fair to say, the prettiest or most functional spoon in my kitchen- but it holds a memory and it’s exceptionally sturdy. My caution around my lack of confidence in knowing how thinly I should scoop out the bowl of the spoon or how narrow I should make the handle has resulted in a sturdy, robust spoon.